Dr. Anthony Kalloo and Dr. Jonathan M. Buscaglia have taken years of experience at Johns Hopkins Hospital and created a collection of unique and interesting cases revolving around gastrointestinal and liver diseases. 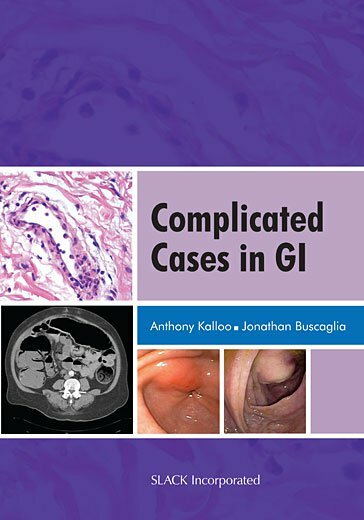 Complicated Cases in GI follows patient-physician interactions and includes over 50 cases that are complex in their nature, interesting in their presentations, or a representation of a unique therapeutic challenge. Complicated Cases in GI also includes 150 board review-like questions taken directly from the cases themselves. The questions highlight the salient aspects and are meant to reinforce the learning objectives involved in each case. They will also serve as a useful study aid for anyone preparing for an examination in general medicine, gastroenterology or hepatology. Complicated Cases in GI is ideal for residents, fellows, practicing physicians preparing for recertification, nurses, and students looking for a quick reference text that can be read and absorbed over time—one case at a time. "The book is written in a way that it can easily be read in a “piecemeal” fashion. The cases are short and succinct. The simple organization makes it easy to read and learn from. The authors do a fine job of presenting the cases in the above mentioned format, complimented by excellent imaging, including endoscopic, radiologic, and histiologic pictures. There is a nice mix of interesting core issues in GI and unusual, unique cases. Overall, the authors and editors have done a good job in presenting an educational and interesting book. However, given the unique nature of many of the cases, the book can serve as a good refresher to the fellowship-trained gastroenterologist." Jonathan Buscaglia, MD is a board-certified internal medicine physician and gastroenterologist specializing in therapeutic endoscopy. He completed medical school at the State University of New York at Buffalo, and then trained in internal medicine at Montefiore Medical Center, part of the Albert Einstein College of Medicine. From there, he completed both his general gastroenterology fellowship and his advanced endoscopy training at the Johns Hopkins Hospital, where he later served on the faculty as Instructor of Medicine. Currently, he is a full-time faculty member and Assistant Professor of Medicine at the State University of New York at Stony Brook. He serves as the Director of Endoscopy at Stony Brook University Medical Center, and also as Visiting Assistant Professor of Medicine at Johns Hopkins University School of Medicine. He is the former editor for the Fellows’ Corner section of Gastrointestinal Endoscopy (GIE), the premier peer-review journal for advanced endoscopy. He is currently a member of GIE’s Editorial Review Board, and associate editor for the DAVE Project (Digital Atlas of Video Education); an educational Web site dedicated to teaching advanced diagnostic and therapeutic endoscopy. Anthony Kalloo, MD is Professor of Medicine at Johns Hopkins University School of Medicine and is the Director of The Division of Gastroenterology and Hepatology at Johns Hopkins. After receiving his medical degree from the University of West Indies Medical School, Dr. Kalloo interned and trained in Internal Medicine at Howard University Hospital in Washington, D.C. He completed his fellowship training program at the combined Georgetown University, VA Medical Center and NIH program. He was an Instructor in Medicine at Georgetown University prior to joining the faculty at Johns Hopkins in 1988. He has special interests in Natural Orifice Surgery, therapeutic endoscopy, biliary and pancreatic diseases, and sphincter of Oddi dysfunction. He is the pioneer of Natural Orifice Translumenal Endoscopic Surgery and is a past Panel Chair for Gastroenterology and Urology Devices with the United States Food and Drug Administration. He is a past Associate Editor for Gastrointestinal Endoscopy. He is a member of the Apollo group, a think-tank endoscopy group. Dr. Kalloo and the Division of Gastroenterology and Hepatology aim to advance the understanding, diagnosis, treatment, and prevention of gastrointestinal and liver disease through patient care, education, and research.